07/15/10 Family to the Seaside, Dog to the Street? Animal Friends continues the "Family to the Seaside, Dog to the Street?" campaign, with the goal to raise public awareness about the problem of abandoning animals, which increases during summer holidays. 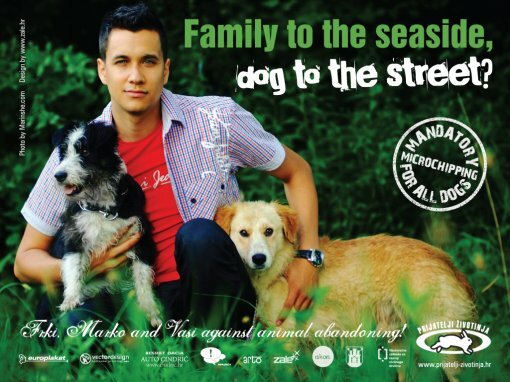 After Franka Batelic, Gala Svilan, Andjela Ramljak, Tatjana Juric, Nikolina Pisek and Maja Vucic, this year's cover face of the Animal Friends summer campaign is the singer Marko Tolja who, along with dogs Frki and Vasi, asks citizens to be responsible with their companion animals and not to abandon them. You will be able to see posters in Zagreb, Rijeka, Split, Sisak, Bjelovar, Osijek, Karlovac, Pula, and Zadar. Frki and Vasi are proteges of the Shelter for Abandoned Animals in Dumovec, where the shooting took place, to draw attention to many animals abandoned by their irresponsible guardians. They are condemned to death or life in a cage in the shelter, waiting for the person who will decide to adopt instead of buying. "I gladly agreed to participate in the Animal Friends campaign because I severely disapprove of abandoning animals. I think it is better people do not get a dog if there is even the slightest thought that some day he could be redundant. I hope that madatory microchipping will help to punish all those who take caring for an animal lightly," Marko stated during the shooting. With this campaign Animal Friends wants to draw attention to the microchipping of dogs, which has been made mandatory for all dogs, regardless of their age, by the Rule book on marking of dogs published on June 19. This will make it easier to return lost dogs as well as enforce the Animal Protection Act, according to which abandoning animals is punishable by a penalty of 15,000 Kuna. Abandoned dogs in the streets and puppies left in front of overcrowded shelters, as well as dead cats on the roads, are Croatian reality. Tourists who come to Croatia return to their homes disgusted by a large number of abandoned animals who often become a danger to people, too, along with a lack of shelters for abandoned animals prescribed by the law and education and adoption programs. Animal Friends invites everyone to sign the petition for the legal ban of euthanasia of animals in shelters, which would prevent their killing and encourage the authorities to properly provide for abandoned animals and sanction irresponsible citizens. The petition can be signed at www.prijatelji-zivotinja.hr. Photographs for the "Family to the Seaside, Dog to the Street?" were taken by Marina Filipovic Marinshe. Stylist for Marko was Ivan Friscic, hair stylist Zvonimir Franic, and make-up artist Lisa Jerichevich. The poster for the campaign was designed by Maja Zaklan. This campaign is supported by the National Foundation for Civil Society Development, City Department for Agriculture and Forestry, Iskon, Zale, Arto, Europlakat, P.I.O., Vectordesign, Auto salon Cindric and the City of Karlovac.